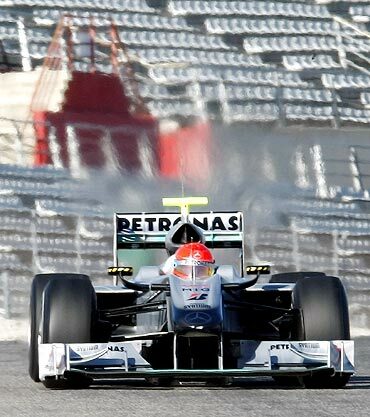 Excited as a little boy with a new toy, seven times world champion Michael Schumacher rolled back the years in his first Formula One test with Mercedes on Monday. "In a way, it's like 1991," the former Ferrari ace told reporters after coming out of retirement at the age of 41, and after a three-year absence, with 40 laps of Valencia's Ricardo Tormo circuit. "When I came into Formula One I was shocked in the first lap and I was extremely excited in the second and further laps. And exactly today I feel like a little, young boy that has his toy in his hands and just enjoys himself." The German, Formula One's most successful driver with 91 wins, ended the opening day of the season's first test with the third fastest time. On a day of comebacks, Brazilian Felipe Massa returned to set the pace for Ferrari six months after he suffered life-threatening head injuries in Hungarian Grand Prix qualifying. Second fastest was Spaniard Pedro de la Rosa, the former McLaren tester back at the age of 38 for Sauber after three years without a race drive. All eyes were on Schumacher however as the German guided the silver Mercedes W01 down the pitlane and out into the Spanish sunshine. German team mate Nico Rosberg had earlier completed 39 laps with a best time of 1:13.543 but Schumacher went quicker after just 18 laps. he ended the day with a time of 1:12.947, according to circuit timings. The lap times meant little, with refuelling banned this season and cars testing with varying fuel loads and specifications, but Schumacher was fizzing as a scrum of reporters surrounded him and jostled for soundbites. "I think we have done a very good job. the guys have done a superb job," said the German, the media attention reminiscent of his glory years. "We did about 80 laps...for the first day I think that is a superb job." 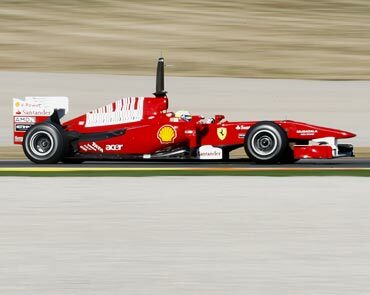 Massa, clearly back up to speed in the new Ferrari F10, completed 102 laps without a glitch or problem. "I'm very happy to be back, I feel very good from a physical point of view. I did 100 laps, but I could have done much more," said the little Brazilian, who added he had been "zero afraid" about getting back behind the wheel. "I'm now 100 percent ready to return to racing." Rosberg, who has joined Mercedes after four years at Williams, was pleased for his new team mate. 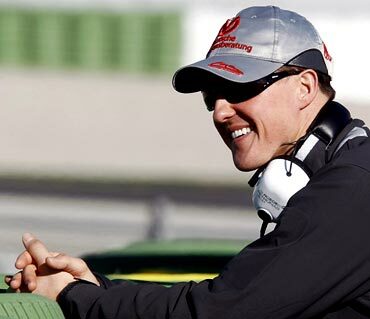 "To have him (Schumacher) here is fantastic," he told reporters. "It has given me a little bit extra motivation I must say, from my point of view. Just that little touch extra." Britain's Gary Paffett gave the sleek-looking new McLaren its test debut, with the fifth fastest time, before world champions Jenson Button and Lewis Hamilton get their hands on it later in the week. 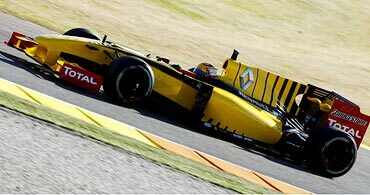 Poland's Robert Kubica made his Renault debut, after moving from BMW-Sauber while Switzerland's Sebastien Buemi gave the new Toro Rosso a first run. None of the four completely new teams are attending the Valencia test, with Virgin Racing due to unveil their new car online on Wednesday and Lotus firing up their car's engine for the first time next Friday before a launch on Feb. 12. Red Bull, last year's overall runners-up, are also missing the opening test to give themselves more time to push development as are Force India.